Filed to: Rumor smashed smashed?Filed to: Rumor smashed smashed? "There are a few things to do, and it will be a while before that happens," Plextek's technical director Ian Murphy said to gaming site Eurogamer, "but yes, the product has been recovered from the liquidators and we are bringing it back to market." 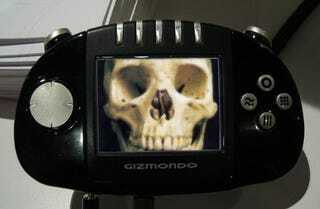 Furthermore, Murphy said that he believes that the damned handheld will succeed this time because "the only reason Gizmondo was not a success last time round was because it was not fully brought into the market." He could have said that "the only reason Gizmondo was not a success last time round was because it wasn't painted in bright pink and decorated with lolcats" and it would have had the same effect on us. Absolute puzzlement. We are still asking ourselves the same questions: How can anyone expect that a previously-failed, ultra-hyped product is going succeed in a second introduction against all probability? Specially, how is that going to happen when mighty and actually credible companies—like Nokia, Sega or Atari—have tried and failed miserably? And what's worse: how can any company get associated with a man that was convicted for fraud in his teens; fined more than a quarter million dollars in 2005 for issuing rubber checks as a car dealer during the 90s; and arrested for illegal guns possession and impersonating a law enforcement agent this year in the US? What is going to make things different from the first time?